The car was going to be up for sale, but I've found another one to donate some parts, so I have renewed enthusiasm! The donor car is actually newer, but has some major (and unusual) rot! here and here are better pictures (they're fairly large!). It's a 1984 (A 92 MBF) GL with a 1781cc carb engine. 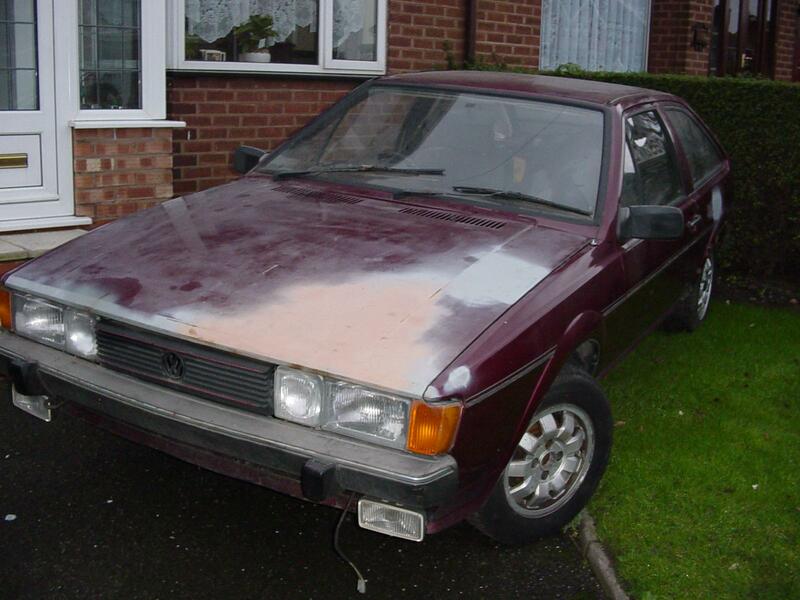 The donor car is a 86 GT (1595cc). I'm in the process of stripping anything useful from it before it goes to the crusher. I was originally going to do things the other way round, but the rot changed that. The 86 GT (D929) IS NOW GONE!. I was thinking about keeping the engine & box, but the engine is a bit rattly after 170,000 miles. Removing the 'GTX style' body kit has exposed rot only usually found here, the result of a crap peice of bodyshop work some years ago, by the look of it. It looks like the car had a n/s/r corner shunt. The valance is definitely a replacement panel, and I think the qtr panel is too. Someone didn't do the rustproofing though, and the cheap, nasty towbar didn't help. 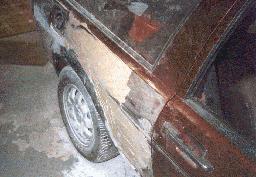 The bodykit was original though- it just makes it more difficult to spot the rot! Just goes to show what can be hidden- admittedly I didn't check the car that thoroughly (it cost £130, and the spares are worth that), but it's a good warning if you're buying a runner. If anyones interested, look here for the pictures of some frightening rot. Of course, the body kit will come in useful for camouflaging my inadequate bodywork skills! The new radiator has already found a home in A92. I've now finally removed the offside quarter panel from D929. It took a lot of patient drilling of spotwelds, and lots of angle grinder related mayhem. The nearside qtr is definitely a replacement, with welding almost as crap as mine, and is rotten (Surprise!). The removal involved cutting great big gouges into the pillars. The intention is to do some kind of cut-and-shut job on the panel into A92. I've got pics of the panel-hacking here in the cut-and-shut gallery! A92 now runs properly again. The Weber carb was full (and I mean full!) of filler dust. (how did that get there, I ask myself?) The brakes are still bust though. The qtr panel I hacked from D929 is coming along. I've removed the bits of metal from round the fuel filler, and the bits of inner arch are coming off slooooowly (but I'm managing to not butcher the panel beyond hope- Pics in the cut-and-shut gallery)- once that's done I get to hack the old panel off A92, and start welding again. The car was recently outside due to building work. The worrying bit is that my Mom has been literally besieged with offers to take the car away by large men with even larger trucks. The surprising bit is she didn't take them up on the offer. She's been very accomadating to one or more of my sciroccos since some time in 1998 (!). It's now safely home blockading her garage again. Moving the car around the (steep) drive with a crap clutch and stuffed brakes is entertaining, in a special kind of way. Update 4/8/03: The quarter panel is virtually off A92. Pics in the cut-and-shut gallery. Why not mail me if you have any comments or suggestions to make.